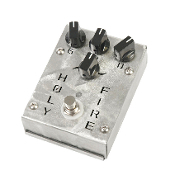 The Holy Fire is a different approach to overdrive and distortion pedals. It's extremely responsive. Go from overdriven sounds to clean tones by rolling back the volume knob on your instrument. Retain your full tone spectrum, boost or cut your volume and dial in YOUR tone. 48v power supply included. This pedal must be used with the included, dedicated worldwide power supply.